Maryland firefighters and medics were honored for saving what lives they could after a fiery wreck that killed 4 people and injured 14 who were headed to church. Nineteen members of the Prince George’s County fire department responded during the November rescue. 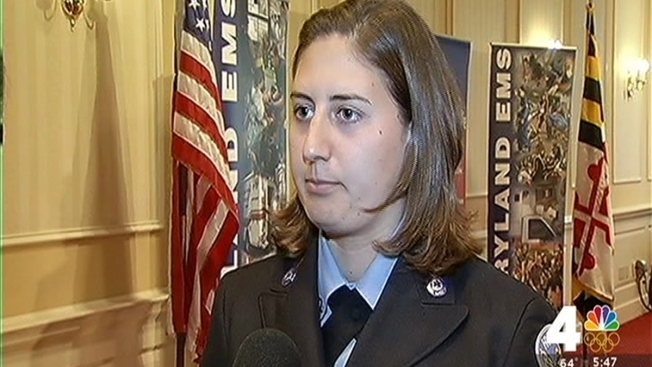 They were honored in Annapolis Wednesday with the Maryland Star of Life Award. The Maryland Institute for Emergency Medical Services Systems gives out the prestigious award annually to an individual or team who performed an outstanding rescue. The crash happened November 8, 2015. The driver of a pickup truck left the scene of a hit-and-run, police said, only to smash into a church van carrying more than a dozen people. Smoke was pouring out of the pickup truck’s windows and two of the wheels were on fire as the driver drove on Chillum Road after the first crash, Freddy Rodriguez, the driver of the church van, told News 4. The pickup truck then swerved and T-boned the church van, which was on its way to Iglesia Ministerio de Dios Unido on November 8, 2015 for a Sunday night service. Some bystanders cut people out of the burning van's seatbelts while neighbors used their personal fire extinguishers to try to stop the blaze until firefighters arrived, NBC Washington previously reported. The firefighters at the award ceremony recalled getting the call towards the end of their shift. “The call came out and we were like... this is bad. We got to go,” Christine Szarko, medic and volunteer, said. One six-year old, Staily Gomez, of Northwest Washington, was killed in the accident. At least one other six-year-old and a 6-month-old baby were among the injured. A pregnant woman was injured and doctors were unable to save her unborn child. A married couple, Santiago Merche, 75, and Elba Linares, 73, of Northwest Washington, were also killed. They had eight children and 35 grandchildren. The driver of the pickup truck, Medardo Flores, 30, of Chillum, Maryland also died in the crash. Joseph Gregor, Prince George’s county firefighter and paramedic, acknowledged the role of all firefighters and medics who respond to disasters as he accepted the Maryland Star of Life Award. “I feel like even though I’m accepting [the award] today, it goes out to every EMS member who ever took a call,” Gregor said.